Anglers far and wide are gearing up for this year’s Annual Ausable River Two-Fly Challenge. Taking place on the iconic and world-renowned West Branch of the Ausable River, the event spans two days with not only fishing, but socializing, demos, and more. There are some pretty sweet prizes as well! Every year, it takes place in mid-May. 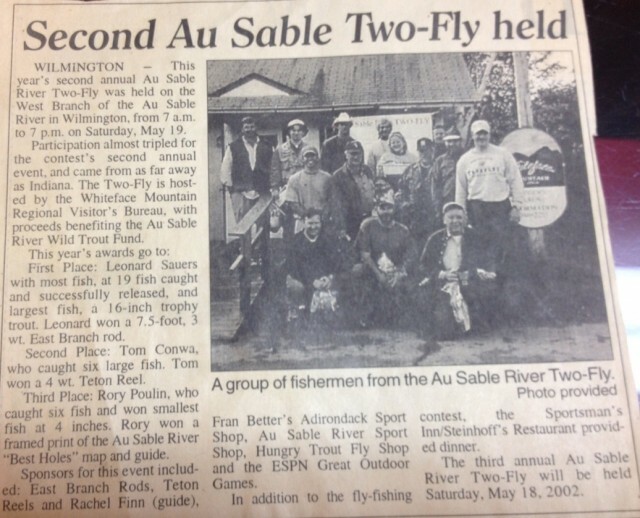 The Two-Fly Challenge was founded by John Lafferty in 2000 as a way to ‘jump start’ the season before Memorial Day Weekend and highlight fly fishing the Ausable River. There were only six contestants the first year. Today, fifteen years later, the field is around 80. The Whiteface Mountain Regional Visitors Bureau has been the organization in charge of the event since about the third year. So what, exactly, is the Ausable River Two-Fly Challenge? It’s a gathering of fly fishing anglers to get together, have fun, socialize, talk fly fishing and, most importantly, to fish. What’s the reference to Two-Fly? Well, the catch is the anglers can only use two flies for the entire competition, and they have to choose them in advance. I’m not an angler, but that sounds pretty challenging to me! During the course of the two days of fishing, anglers are on the honor system to document the number of fish caught, and the measurements of each, prior to releasing (the event is strictly catch and release). The person with the most combined number of fish and inches wins. Everyone fishes in pairs to keep the competitors on the up and up. The weekend starts off on Friday morning with the competitors registering and picking up their score cards from event headquarters at the Whiteface Tourism & Info Center in Wilmington. Then they head out on the river, where fishing takes place from Noon to 8pm. The 8pm evening end time allows anglers to take advantage of the evening hatch that day. Fishing on the second day takes place from 7am to 4:30pm. New score cards for the second day of fishing are picked up first thing in the morning at either the Ausable River Two Fly Shop or the Hungry Trout Fly Shop. On Friday evening everyone gathers at Whiteface Mountain Ski Center for socializing, fly fishing demos, cocktails and food. There’s a fly tying demo, live music and a casting competition. The bar is open at 5pm and anglers must turn in their score cards for the day by 8pm. This is the part where the fish stories are told, I think! On Saturday evening a banquet and awards party is held once again at the Cloudspin Lounge at Whiteface. Sponsors donate some pretty nice prizes, including fishing rods from Hardy Products. The Ausable River Wild Trout Fund is the annual beneficiary of the proceeds from the Two Fly event. 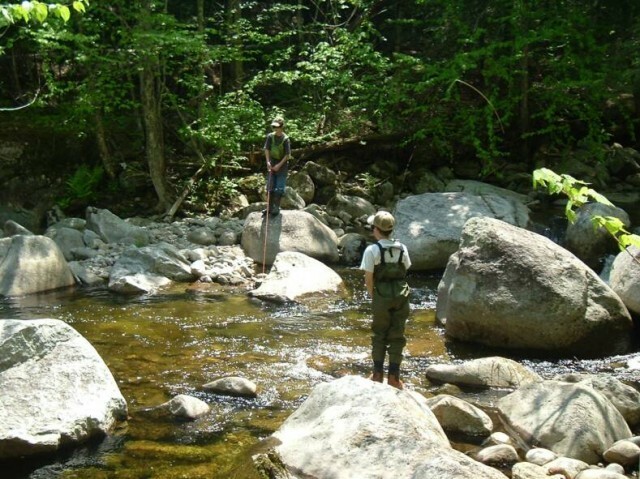 The fund was set up to help preserve the trout population in the Ausable watershed so that fishing will be a sustainable sport here in this magnificent place for decades to come. All in all it sounds like it's turned into a really fun weekend of fishing with great camaraderie during the fifteen years of the event. After talking with Tom about the event ,and fly fishing in general, I decided I’d really like to try this sport. I used to love fishing with my Dad, but never fly fishing. Perhaps one day I’ll do so and be good enough to try this event for myself. In the meantime, I’ll be watching from the riverbank. If you're thinking about competing, think no longer and jump in. It's strictly a fun competition, so don't be intimidated. Download the brochure with all the information you need. If you need lodging, check out our accommodatons options as well. See you there! 3... 2... 1... It's Fishing time! But,"Where?" is the question.